Chevrolet launched its carbon-reduction initiative five years ago, coinciding with the launch of the first-generation Volt, and has remained committed to reducing its carbon emissions since. The brand is happy to report it has met its community-based goal, keeping 8 million metric tons of carbon dioxide from entering the atmosphere. “Chevrolet launched this carbon-reduction initiative in 2010 when we debuted the Volt to demonstrate our commitment to a clean energy future,” said Alan Batey, General Motors North America president and Global Chevrolet brand chief. “Since then, our Volt customers have driven 700 million electric miles and renewable energy is powering nearly a tenth of our company’s U.S. energy consumption. 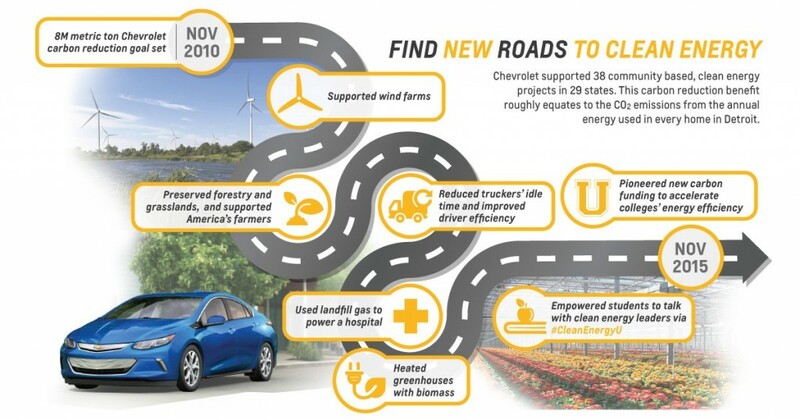 Chevrolet has collaborated with hundreds of climate stakeholders to support carbon-reduction projects in 29 states. The brand itself has even retired its carbon credits to benefit climate, instead of using them to offset its own vehicles and operations. “I don’t think I will see again in my professional lifetime the kind of leadership – the sheer scale, the investment, commitments, diversity of team – that Chevrolet pioneered with its carbon-reduction initiative,” said Bob Sheppard, corporate sustainability consultant and advisor to the Chevrolet program. Chevrolet has invested itself in creating long-term support for clean-energy projects and has expanded the carbon market by pioneering new methodologies enabling college campuses to draw on carbon credits from the voluntary carbon market to help further their large-scale energy efficiency efforts. Great job, GM. Keep hammering away and again you will show to the world your the best! Reducing “plant” food we all breath out. Hmm. How about we just realize that emission of REAL pollutants NO2, CO, are down from the 70’s. and Air is much cleaner. (heck even water is cleaner, I remember lakes you could not swim in the 70’s. Heck one river in Cleveland caught fire then. I think this limbo game of how “low” can you go needs to be reevaluate. Let people buy what they want. Not what is forced down their throat by the “latest” technology. Ever wonder why “economy” cars cost more than they did 20 years ago (and it is not just inflation either). Agree with most of what you said. On a personal note: In 1995, I was in need of a car that got good fuel mileage. I test drove all the small cars with exception of Toyota and Hyundai, which to this day I will never consider putting either one in my driveway. There was not one person who did not recommend a Civic of course, but I ultimately ended up with the newly redesigned Chevrolet Cavalier with the 2.2 and a stick. Everyone thought I was crazy for picking the small Chevy, but for $11,287.43 out the door I ended up with a fairly base car with power steering, 15 inch wheels, up-level cloth seats and A/C. Things I didn’t have in my 67 C-10 which to that point was my daily driver. Also, the Cavalier was over $3,000.00 less than a comparable Civic. I drove that Cavalier for over 100,000 trouble free miles before selling it, and being a record keeper I averaged 32.7 mpg during my ownership. My worst tank ever was 26.3 mpg and the best was 42.1. There aren’t many “economy” cars on the road today with all the new tech that can touch what I achieved in that Cavalier fuel mileage wise. It always passed California smog certification with flying colors. It is truly a shame what the government and the automakers are doing to consumers with the CAFE standards and the phony carbon footprint guilt trip. I don’t applaud GM or Chevrolet for this achievement because all this lets me know, is this is why we aren’t seeing any hot rod Sonic’s or Cruze’s to compete with the hot rod Focus’s and Fiesta’s. Not that I am in the market for a car like that at this point in my life, but it’s nice to know they are there for others who want one. Thank goodness for just a little while longer we can still get our Chevy Trucks, Camaro’s and Corvette’s with those glorious sounding and potent V8’s that make all the greenies cry. As long as GM achieves it’s max hp rating then I will be happy. Carbon footprint I could care less about! Do burn outs help or hurt the carbon footprint ?